Amid China's tumultuous dash to become rich, one man's photographs of families posing with their worldly goods will soon seem like records from a distant era. Huang Qingjun has spent nearly a decade travelling to remote parts of China to persuade people who have sometimes never been photographed to carry outside all their household possessions and pose for him. The results offer glimpses of the utilitarian lives of millions of ordinary Chinese who, at first glance, appear not to have been swept up by the same modernisation that has seen hundreds of millions of others leave for the cities. But seen more closely, they also show the enormous social change that has come in a generation. So the photo of an elderly couple of farmers outside their mud house reveals a satellite dish, DVD player and phone. "People's lives have changed enormously. Maybe their incomes haven't been affected as much as in the cities, but their thinking has," says Huang, 42, who was born in the oil-frontier town of Daqing and now lives in Beijing. Huang took his first pictures as a teenager, inspired by an uncle in an era when the obvious hobbies for the young were calligraphy and singing. His first proper camera, bought when he was 18, was the most valuable item in the family home. 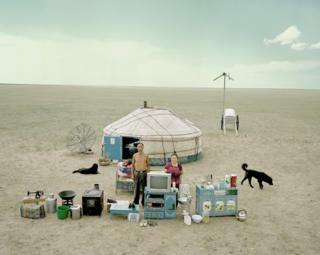 The idea for the series about people's material goods, now called Jiadang (Family Stuff), came in 2003 with some photos he took for the magazine Chinese National Geography. But the project didn't really get under way until three years later, when Huang started travelling around China looking for suitable places and people. "Most people thought what I was proposing was not normal. When I explained I wanted to set up a photo, that it would involve taking everything out of their house and setting it up outside, that took quite a lot of explaining," he says. "But almost all of them, when they realised what I was trying to do, they understood the point." One advantage of travelling to remote, poor areas was that people didn't have many possessions. "They're not like people from the city, who have so much stuff that if you asked them to do it they'd reply it was too much effort," he says. Some of the projects took a couple of days, others several months as he waited for one couple to move house. Their home, like millions of others, had been slated for demolition to make way for tower blocks or offices. As they sit on their bed, the wall behind them is marked with the Chinese character chai, meaning "tear down." But it was a happy day, because the couple had received the compensation they had asked for. Huang's project has taken him to 14 of China's 33 provinces, giving him an unusually broad perspective of how the country is changing. He is optimistic about the process, and where it will lead. "In lots of Chinese villages, the government has delivered roads and connected them with electricity. This has been a huge change. If you've a road, you can move about. If you've got electricity you can have TV, you get the news and ideas about what the outside world is thinking. "The biggest problems in rural areas now are how people can get better education for their children, and healthcare," he says. Many photos appear to capture something that is about to be lost. Families camp as if about to move on. They are framed by houses that have just been expensively renovated or are about to be pulled down. The preponderance of cooking utensils, the paucity of clothes and items of leisure suggest a lifestyle that is about to be upended. Most families have already acquired a TV, a few have washing machines. The pedal-driven sewing machine which in their parents' generation was every housewife's dream - known as one of the "four big things" - is pushed to the back of a few pictures. Image caption A newly renovated house and a washing machine show the real change in a small Guizhou village. Image caption This photo, taken in the hometown of one of China's most famous writers, Lu Xun, shows two men and their now antique furniture. Image caption This couple were photographed in Daqing, Huang Qingjun's hometown, and the place where China first struck oil in 1959. The man, a driver, has since done well enough to rebuild the house. Image caption Maize ready for the long winter and a picture of Beijing's Tiananmen Square are key possessions in this household in the poor, inland province of Shanxi. Image caption Film director Zhang Yuan outside his Beijing home. This is one of a handful of photos of middle-class subjects, with a car, books and consumer goods. Image caption A fishing family in the southern province of Guangdong - almost all their possessions on the boat are related to cooking. Image caption A car and a collection of ceramics.... an art dealer's possessions are a far cry from the treasured belongings of Huang Qingjun's usual subjects. It can't be long before the consumer goods, brand names and luxury goods that have been voraciously snapped up by China's urban middle class begin to sneak in to the pictures. A BMW car and flat-screen TV can already be seen in his portrait of film director Zhang Yuan, outside his home in Beijing. The Family Stuff pictures have not been widely seen outside China, though some have been shown at exhibitions in Paris and New York. Next year marks the 10th anniversary of the first photograph, and Huang plans to mark it by returning to the places he visited - or those that are still recognisable - to see what has changed. "In the last 10 years, China has seen such a fast rate of growth, I want to go back and see what the effects have been on their lives," he says. He also hopes to broaden the project's range, including people from a wider range of backgrounds, like entrepreneurs and government officials. He's even thinking about asking Jack Ma, an internet entrepreneur and one of China's richest men. "Those pictures probably couldn't manage to contain all of their possessions. But it could include the things they use every day. "From the possessions each family uses in their daily lives, you get a good sense of the real levels of life for China's people."